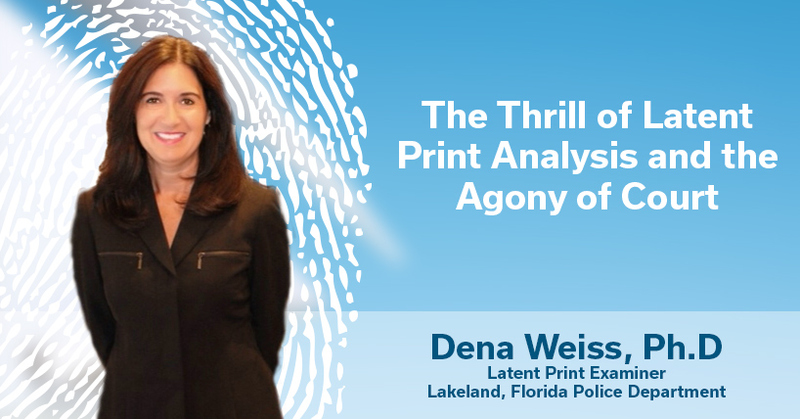 “I enjoy the thrill of identifying fingerprints,” says Dena Weiss, Ph.D, a latent print examiner for the Lakeland, Florida police department. Weiss has been involved in forensics in a 30-year career that started with processing crime scenes. She has collected and examined all kinds of evidence, but latent print examination is the process she enjoys most. She especially likes working with palm prints. Less of a thrill is testifying in court. While she has 22 years of experience as an expert witness, it is still something she doesn’t look forward to. “Testifying can be extremely stressful, and lawyers are intimidating as they try to discredit the evidence and the investigator,” says Weiss. While she hasn’t had the opportunity to work with a computerized documentation system like Mideo LatentWorks ™, she knows that great training, following a solid process, and creating excellent documentation are essential to the effectiveness of latent examination. She recently finished a Daubert hearing, a pretrial assessment where the judge determines whether an expert used valid methodology that has been scientifically tested. This particular case involved the robbery and assault of an elderly victim. The only evidence in the case was a palm print found on the outside of a refrigerator, which had been moved to block a back room where the injured victim was left after the assault. Weiss identified the palm print as originating from the suspect, who had recently been released from prison. The defense called a Daubert hearing to argue the reliability of the science of fingerprint analysis in an effort to throw out her testimony. After several depositions and gruelling hours of testimony, the state won the Daubert hearing. The latent print evidence was used for the trial, which resulted in the suspect receiving 25 years in prison. “Seeing the relief on the elderly woman’s face after the suspect’s sentencing was heart-warming,” Weiss recalls. So how does she create solid cases that hold up to such scrutiny? It starts with training. She notes that this typically involves 2-3 years of learning the process of latent examination. Agencies handle training in different ways. Some use computerized systems like Mideo TrainingWorks that present consistent material and keep progress documentation. Others have more paper-based approaches. It is important to be trained by an experienced mentor in the field, Weiss notes. Working together to study key characteristics present in a fingerprint on an enlarged computer screen provides a deeper understanding of the features crucial to making identifications and/or eliminations. Beyond the formal training phase, latent print examiners need to continually hone their skills. Weiss credits her success with an ability to patiently sit for hours evaluating every fine detail of latent prints and the known exemplars. An examiner must learn to understand how ridge features are developed and formed and to discern the characteristics within the ridges. Trained examiners understand the genetics behind the formation of fingerprints and the relevance of the ridge position of each of these features. to verify the examiner’s work. “Verification is extremely important. Someone should be able to follow behind you using the same protocol and make the same conclusion,” Weiss says. All this work needs to be documented. Weiss still uses handwritten notes and she acknowledges they can be hard to decipher after the fact. She adds that with computerized documentation that the prosecutor can review, the examiner may not have to explain so much. It could also help with the completeness and accuracy of testimony. In the end, computerized documentation can provide clarity to an examiner’s notes and lessen the stress of testifying to case notes years after the investigation. And that can take some of the pain out of the courtroom aspects of the latent print examiner’s job.